"Majority of my Facebook friends are artists and art related people whom I have met before or artists whom I would love to meet in person one day. Facebook has become a virtual art salon to me. Of course I would prefer to meet friends and discuss things face to face but everyone's busy schedule and different location (many of them are international friends) won't allow us to meet face to face easily. Because of the Facebook I feel so close to far away friends and family as getting everyday information is so easy. We can discuss our concerns or social issues anytime and pass around important news instantaneously. It is the biggest power of social media and I think artists are playing an important part in supporting our freedom of speech and expression through social media like Facebook. My “Thank You Artist Friends on Facebook Project” allowed me to look closer at each of my artist friends. This project made me think about our crazy everyday life and let me take a longer time to reflect and question how we process any single image from the Internet. I decided to reproduce a small profile picture of each of my artist friends on a small ceramic tile to be able to feel his or her presence real and make the moment permanently frozen in time. I was hoping that those portraits, being the physical images on tiles, would remain to be “real” despite being shared only virtually with friends. I had looked thoroughly at each of my artist friend profile picture on my cell phone and when I finished making a tile portrait I got a feeling that each time I learned something new about this person. 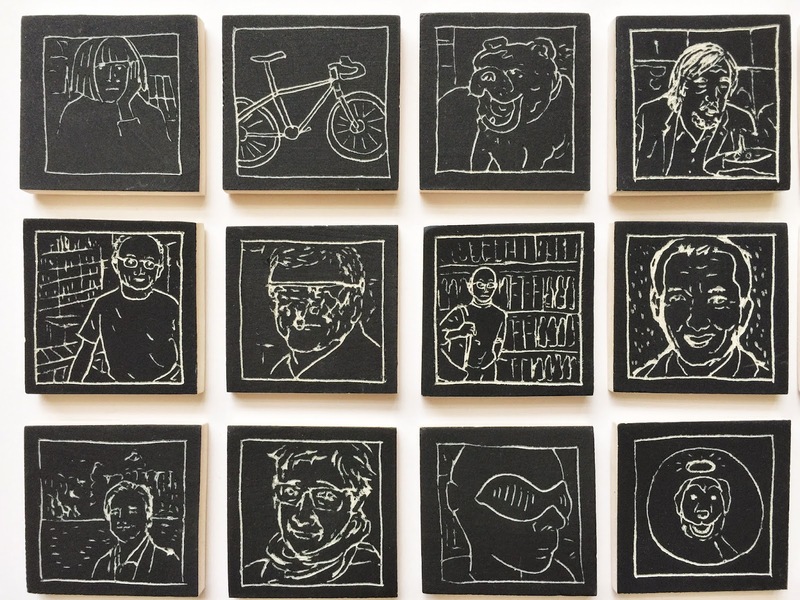 I had made porcelain tiles and sketched/etched each artist profile picture directly on them. There was no eraser or pre-sketch practice tiles. I prepared only one tile for each friend and used only a needle tool to make each sketch. I had really stayed focus and be careful not to damage their "face" which they chose to share with public on Facebook. As an artist and an art supporter, I tried my best to focus- during etching of each artist portrait- on our time together and concentrating my thoughts on the person and how to show my appreciation and respect for each of them. I am very happy to have a chance to show those portraits at the exhibition and share my admiration to their persistence and achievements. I plan to keep adding the tiles as I make new artist friends on Facebook."